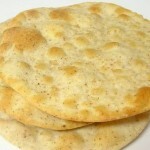 Lavash is an Armenian food recipe for flatbread. Blend the warm water, olive oil, sugar, and yeast. It will take about 5 minutes on low speed. Stir in the salt. Gradually add 2 cups of the flour and beat on low speed until a thick and smooth batter forms. Knead in the additional 2 cups of flour. Allow the dough to rise until double in bulk, about 1½ hours. Punch the dough down and divide into 8 pieces. Let stand, covered for 15 minutes. 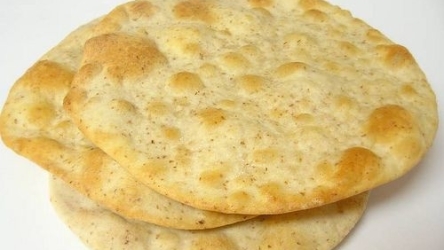 Roll out each piece of dough into a 12-inch circle. Working with 2 pieces of dough at a time, arrange breads on ungreased baking sheets. Brush with milk and sprinkle sesame seeds over tops. Pierce with a fork many times, all over. Bake on the lowest racks in the oven, at 375F, for 8-10 minutes, or until light brown. Rotate the pans in the oven from top to bottom, to insure even browning.